So, if you’re a regular reader of the blog, you’ll know that I’m pretty enamored with Aeon’s End (AE). It turned out to be my hidden gem find of Essen 2016. Sadly, in order to be the “hidden gem”, that also meant that it spent a lot of time on the game shelf before it finally hit the table. It seems like every year, one of the last ten games that I try from Essen becomes one of the top hits of the year for me. 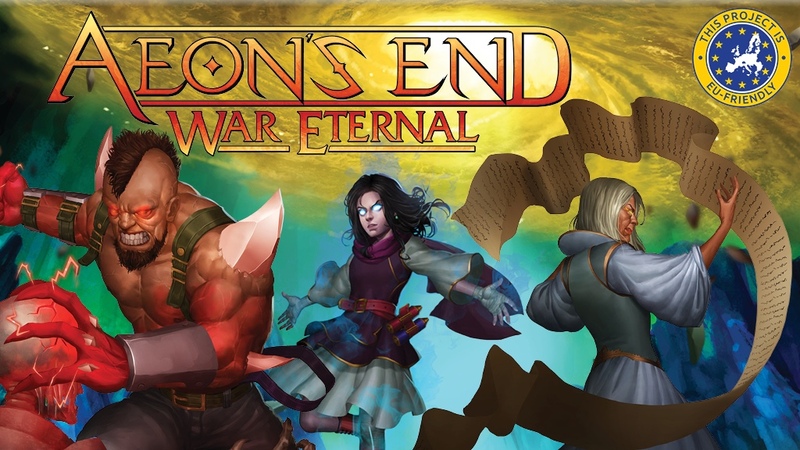 So, what’s going on with the new set of Aeon’s End: War Eternal (AE:WE)? Well, it’s actually being funded on Kickstarter, and we were given a chance to give in a runthrough with an advance set. The set I have is not completely final as there are some changes to the artwork and layout from the set I have – but I have been told that the content is final. This new box is a standalone expansion – think of Dominion: Intrigue and Dominion. You will get everything you need to play the whole game in the box. 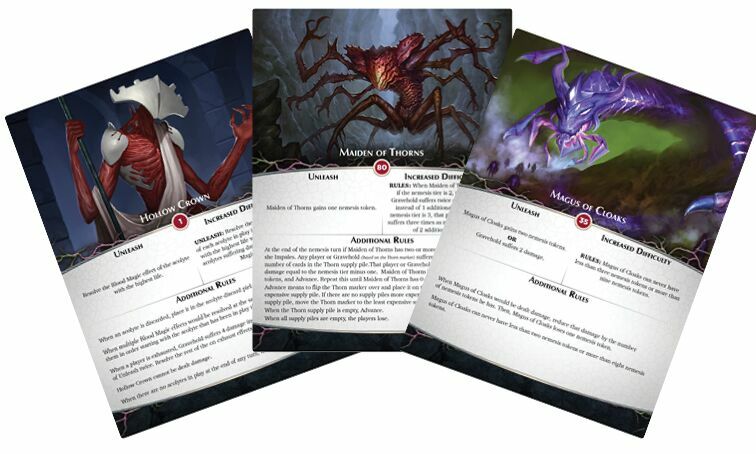 Everything in AE:WE works with the stuff from the base game, so if you have the base, you can think of this set as just a whole new set of cards to increase the variety in your games. So… this essentially doubles the amount of stuff that you have from the base game (at least in terms of heroes and Nemeses – I don’t actually know how the count works out for the gem/relic/spell cards). The expansion is created to standalone, but the components are also meant to work with those from the base game. While our initial games were just using the new stuff, I have played once using my favorite Nemesis from the original set with the cards and heroes from AE:WE and everything worked seamlessly. Thus far, there does not seem to be any issue with “power creep”. 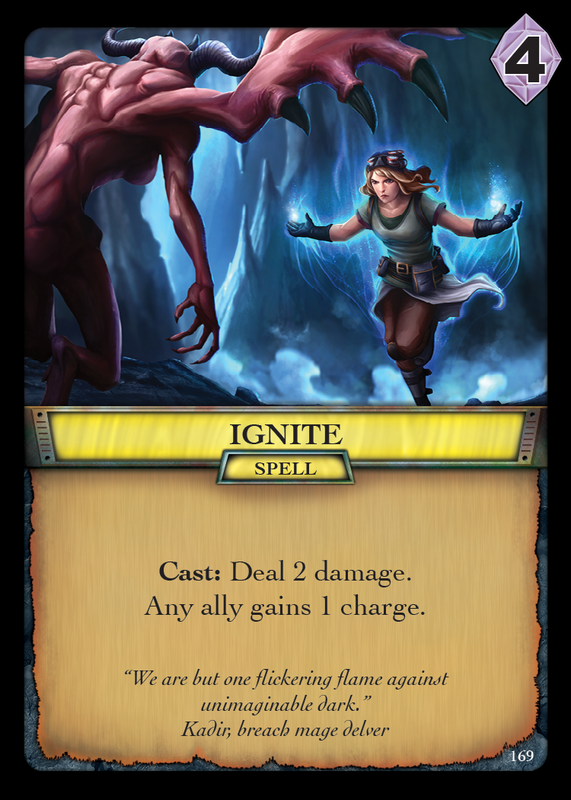 There are plenty of new ideas in the AE:WE components, but they do not seem to be overpowered compared to the ideas from the base set or previous expansions. 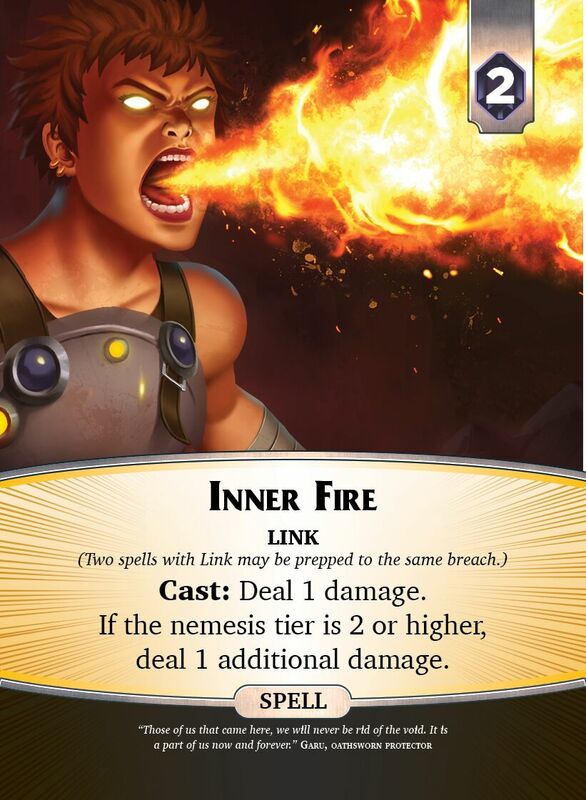 Additionally, the new basic nemesis cards do not seem to be stronger than those in the original game. With the base game, we always felt that we had a decent chance to win by simply taking a random setup of cards (usually using one of the proposed cost setups) and then figuring out how to use the particular card abilities – and hero superpowers – to best fight the Nemesis. This comment above from Mr. Riley suggests that our problem solving skills might need to be shifted back in the setup process. I’ll be interested to see how my usual group responds to the idea that we could pick out specific setups to fight the Nemesis. It’s unclear at this point whether the new harder Nemeses (and the possibly necessary non-random setup) will be a positive change or not. If nothing else, I may just have to remember which are the easier ones when we want a random setup and which ones will require a bit more team planning from the start! One of the things about the original Nemeses which I liked was the way that you had to plan differently for a game based on the new set of Random cards (and randomly chosen Heroes) that we picked in setup. The new harder Nemeses seem to take this element away while increasing the challenge inherent to the Nemesis. 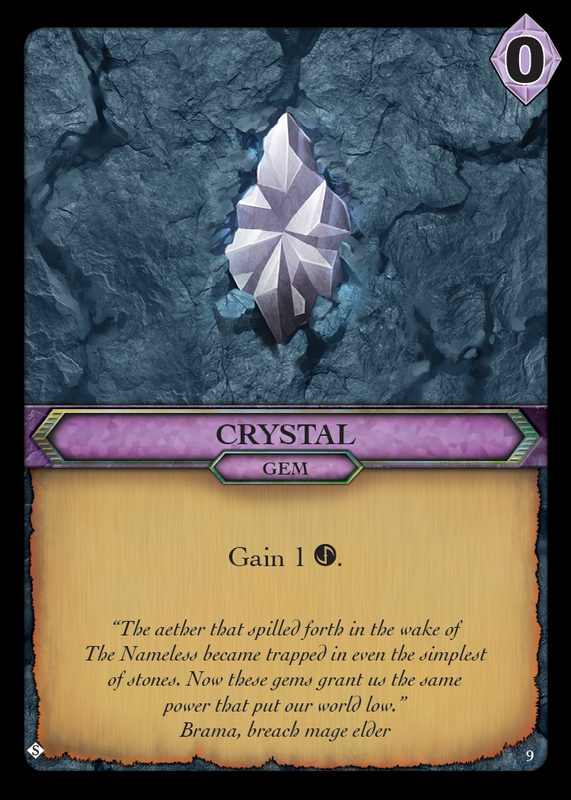 The gems/relics/spells all seem to give unique actions or at least new twists on them. If you have the base game, you will definitely have a lot of choice now! One facet of the game that my old group could never figure out is how to set up the game to really allow for a good deck-thinning process. With the new cards, there are now many more options to allow people to move cards. There are also plenty of new ways to focus breaches and manipulate prepped cards. I again will state that I haven’t gone through to directly compare the text on all the new cards, but none of them felt like they were repeats. At least three of the new Nemeses use “Nemesis Tokens” which are, unsurprisingly, used in a different way for each Nemesis. For one, the tokens act as a blocker shield while for another it helps cause damage to heroes. It’s a nice mechanism to allow for Nemesis variety. 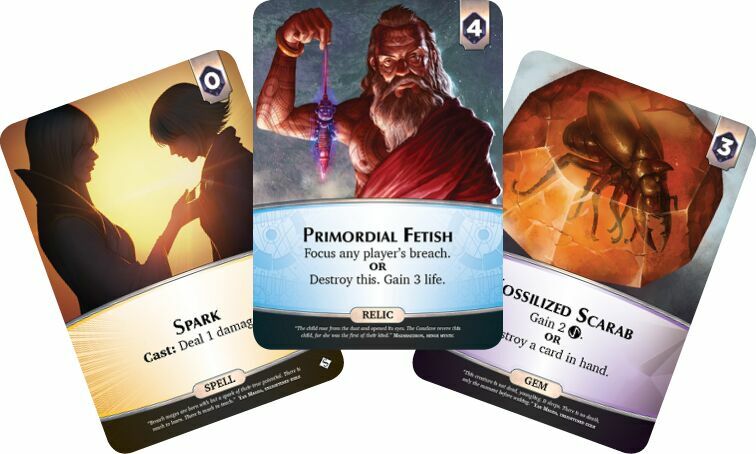 The other big advantage that I think will come from the expansion is that we have a much larger pool of basic Nemesis cards to pull from. After about ten games, the only thing that felt a bit predictable was that we became very familiar with the basic Nemesis cards. With a larger pool (and a random setup from those cards), we won’t necessarily know that we have the “Gravehold loses 18 life” card coming up soon or know that we need to save up small spells for a particular minion we haven’t seen quite yet. Now, there will be more uncertainty in the composition of the Nemesis deck – and that is definitely a good thing. As far as the artwork goes – I can only comment on what I see on the KS page. The new artwork looks great, and the new layout should be an improvement. There was some issue with the original card text being hard to read. The new cards have a better layout which makes it easier to find information. 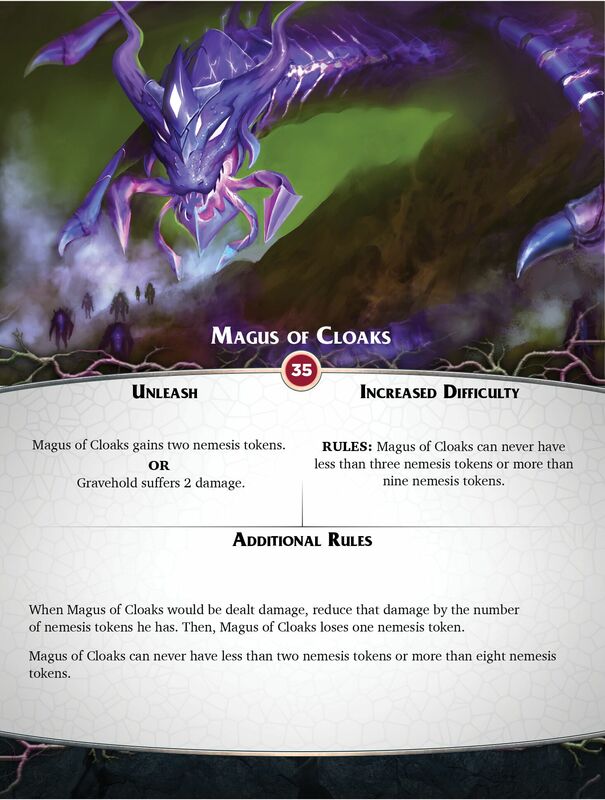 There also seems to be a lighter background for the main text area which makes it easier to read – the three classes of cards each have a different color background – also making it easier to see them from afar. Below are some examples of what the new cards will look like as compared to the older ones. Though they are changing the card layout, the card backs will remain the same – so you can still easily combine the new and old cards without issue. There is going to be an “update pack” which will have reprints of the old cards with the new format – but this appears to be only a change in physical appearance; there does not appear to be any content change. So, if it bothers you to have mismatched cards, you can get new ones. However, it was kinda nice to be able to tell which ones came from the old set and which ones came from the new – so I’ll prob just leave my original cards as is. The only other thing worth mentioning component wise is that after playing with the new set, I am definitely a believer in using dice to mark things in the game. I personally did not like the life discs for the Nemesis and Gravehold in the original game – so we had always replaced those with dice. But, in our last session, we used dice for everything: Nemesis, Gravehold, individual hero life, Minion life, Nemesis tokens, etc. It made the game much easier to follow as we could instantly see the value on all the dice on the table. Lucky for me, I have a box of about 200 polyhedral dice that we use for mega Button Men tournaments, so there are plenty of choices of colors and sizes to use. Of course, YMMV on this – but I thought I’d mention it because there is actually an accessory kit offered on the KS where they provide you with dice… so, I must not be the only one who likes the dice! Overall, I really like what I’ve seen so far. It’s too early to give it a rating – but I loved the base game, and this seems to only make the game better. If you liked/loved Aeon’s End, this will give you a lot more flexibility in setup and more variation in play (if you even feel like you need it yet!). I’ll admit that I don’t feel like the base game is getting old after 10-ish plays, though the new cards are definitely a welcome addition. Which should you choose if you don’t have either? Honestly, you probably can’t go wrong with either one. 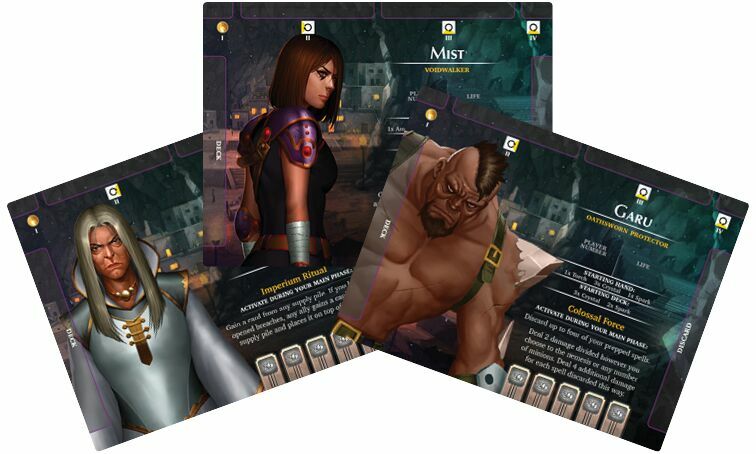 If you choose the base game, you will have the original card layout which is a bit crowded and dark. However, the Nemesis seem a bit easier, and this might be a better place to start. The base game also has a very nice setup tutorial for the starting player, and I don’t know whether this will be included in the AE:WE box. The War Eternal expansion will have the new layout while still giving you all the things you need to play the game. The harder Nemeses may need more tailored card setup whereas the easier ones in the base set allowed for more random setups (at least in my opinion). Which is better? That’s up to you and your group. I like having the option for both as each situation calls for a different approach. I think that I would currently lean to preferring the ability to randomly setup – but I haven’t really tried the focused setup yet, so it would be unfair to pass judgement at this time. In the end, you probably can’t go wrong with either. The game is fantastic, and whichever box you have will give you a great co-operative game that changes every time you play it. I’m glad to have both, and once this review is done, I’m going to combine all the cards into a single box to be able to have the ability to choose for all the awesome options in each game! This entry was posted in Kickstarter, Preview. Bookmark the permalink. Nice review. From experience only with AE:WE, I must say that a random market setup does feel a bit lacking. Often instead of being excited to see a new card show up in your game, you are pining for your favourite that you know would have been more helpful. 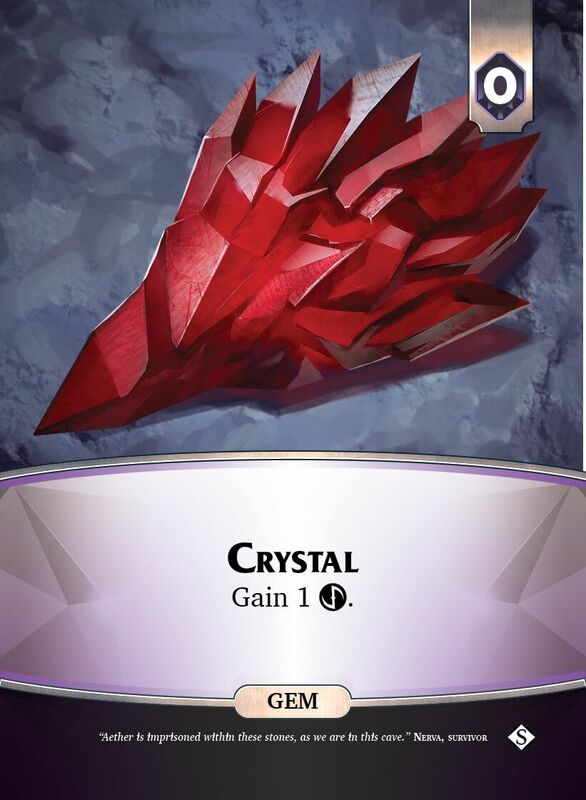 So you lean towards a cherry-picked setup, Which means you kinda end up with a permanently established market of your ‘best’ 9 cards – does this harm replayability? I dunno, I guess when you get bored of those cards you could swap different ones in, or move back to random to up the challenge (perhaps removing cards you really don’t like, so you are never completely bummed by what turns up). Might just be me, but I find the whole process of selecting the market cards to be rather disconcerting! I’m also uncomfortable with the random selection of what beasties to include in Ethnos! So here, I always play with the same beasts that I think make for the best game. Maybe I’m like, OCD or something.